Sycle wrote: How about transit pipes (like Sonic, but they could look more like the ones in Futurama) that could move you about the level? Or a 'gravity switch' or 'sticky mode' which would allow you to travel along the walls temporarily? Nice idea, but would transporters (teleporters) do instead of transit pipes? About sticky mode, I will think about it. nikki wrote: Nice idea, but would transporters (teleporters) do instead of transit pipes? About sticky mode, I will think about it. I am not a Star-Trek fan. In fact, I haven't watched even a single episode of Start-Trek. Furturama style pipes sound like a great idea - though ideally they are tight fitting so I don't know if the physics has problems? Ok, I have started working on Transporters. When you enter a Transporter, you are sent to a Receiver. In the level editor, you can set parameters for all objects. For the Transporter, the parameter is the name of the Receiver. For the Receiver, the parameter is its own name. So, for example, we make a Transporter and set its parameter to 'check'. Then, we make a Receiver and set its parameter to 'check'. Then, in the game, when you enter the 'check' Transporter, you will come out of the 'check' Receiver. I also added a few other useful features, such as using T and G to adjust brightness, R and F to adjust camera height (alows a top-down veiw), and, most importantly, directional light and shadows! From the game super mario world. You have colored cubes (that are in wire frame mode), when you hit the switch it fills in the blocks (allowing to walk on them or in your case push). The futurama tubes would be very cool. Aiursrage2k wrote: You have colored cubes (that are in wire frame mode), when you hit the switch it fills in the blocks (allowing to walk on them or in your case push). Ok, maybe I will add it. Last edited by nikki on Fri Jan 19, 2007 9:58 am, edited 1 time in total. A demo has been released! Check the first post for a download link! Nice game. The next thing to add would be way points. As I made it across the river, only to be killed by the spikes (twice). Also there are situations where you can push the blocks into an unwinnable situation. I suggest having a reset switch ala xenosaga puzzles, that resets the blocks to there start location. Aiursrage2k wrote: Nice game. The next thing to add would be way points. As I made it across the river, only to be killed by the spikes (twice). Thanks for playing! I will add waypoints, but only for the tutorial level. In the other levels, the Player should be able to go by himself. About pushing the blocks into unwinnable situations, the reset switch should restart the whole level? Or just the blocks? I think that it better restart the whole level. Did you finish the 3rd level? I just downloaded and tested GraLL this evening and I must say that youve made a really nice game! Your art pipeline seems flawless as I mentioned in a previous post. Very important to have that. One suggestion would be to use a scripted level format which could provide more varied content. Maybe next game? About the game, I love how you can build all sorts of intresting levels with just a few game elements. They work well and it feels intuitive how you should use them. Spikes and bombs looks dangerous. Crates in the middle of a room can be pushed etc. I can also understand that it is tempting to show off all different game elements in the first level but then you take something away from the player. You take away part of the exploration joy because finding out about new game elements (such as the moving platform) and learning how to use or not use them can be as enjoyable as making it to the next level or even more so. Also If you slowly introduce new game elements then there isnt such a great need to have a tutorial level at all since the player will gradually learn how to interact with the new content. There is a very intresting article over at Gamasutra.com about this that everyone designing a game should read IMO: Gameplay Design Fundamentals: Gameplay Progression. The best structured games start out extremely easy to allow all players to quickly experience the reward of game progress (by completing the level, winning the race, or defeating the opponent). Over to a bug report. 17:57:23: SpeedBoost with ID 156 created. 17:57:23: Door with ID 157 created. 17:57:23: Fan with ID 158 created. 17:57:23: EndPad with ID 159 created. 17:57:23: Acid with ID 160 created. 17:57:25: Spikes with ID 162 created. 17:57:25: Spikes with ID 163 created. 17:57:25: Spikes with ID 164 created. 17:57:26: An exception has been thrown! Description: OverlayElement with name GUIBase.w31 already exists..
21:04:01: Spikes with ID 101 destroyed. 21:04:02: Key with ID 150 got message 'Touched' with value ''. 21:04:02: Key with ID 150 destroyed. 21:04:03: Spikes with ID 150 created. 21:04:03: Spikes with ID 101 created. 21:04:03: Spikes with ID 99 created. 21:04:04: |Door|DoorB| with ID 151 opening. 21:04:04: Spikes with ID 150 destroyed. 21:04:04: Spikes with ID 99 destroyed. 21:04:04: Spikes with ID 101 destroyed. 21:04:04: Door with ID 151 destroyed. 21:04:05: An exception has been thrown! Last edited by Borundin on Sat Dec 30, 2006 10:06 pm, edited 1 time in total. Thanks for the wonderful reply, Borundin. I have seen it crash for that reason too, but I'm not sure (and haven't been able to find out) why exactly. It is related to BetaGUI. I have talked to Betajean about it before. He sent me a version of the library that was supposed to fix it. It seems that this happens when the number of windows created exceeds a certain amount. I am not blaming it on Betajean, though. Thanks for your comments on gameplay and the introduction of features to the Player. Instead of teaching everything in one level, I will teach fewer elements in a level and make more 'tutorial' levels. I am going to read that article you posted a link to now. ps. You can press the 'N' key (when not paused) to skip to the next level. Don't do in the 3rd level (last one), because the application will close (close, not crash). You can use the 'P' key to pause. Use 'T' and 'G' to adjust brightness. nikki wrote: Futurama pipes? Whats that? Sorry, they are long transparent pipes which, in the programme Futurama, are used to transport people between places. So you just enter te pipe at one end and you get fired to the other end. Yeah, I found out about it. Did you play the demo? I can't even past the first level, and can get on the sliding planes of the second one (using the "n cheat" ). Yeah, I know. Its not for the faint of heart. If that was tough, you should play Jumper 2 and Chip's Challenge. When you start, you face south. First, wait for the moving bomb to just pass you while going south. When it does, quickly run to the crate but DONT push it. Get into the little gap to the west of the crate to stay safe. Wait for the bomb to come back. Just after it turns around, push the crate east. Then, run north, then west, back south, and get the blue key (do this fast, or the bomb will get you). Wait for the bomb to engage in a circular motion. When it does, get just behind it, and go toward the blue door. Open it, and enter the hard part. Make your way across the bombs (cant explain how). Then, push the first crate into the acid, and then the one that's south. While getting the the last crate, beware of the bomb. After the three crates are in the acid, run fast and jump over the last part (there are 4 grid spaces filled with acid). The rest of it is pretty self-explanatory. Nice idea, but would transporters (teleporters) do instead of transit pipes? Nice game. I must say that it is rather tough though! I am still completing the first level. There are two suggestions that I have. The first one concerns the camera view. Currently, the camera is always behind and above the robot. If the robot starts spinning, then the camera starts following around at a terrific rate, and makes the visibility of the gameplay extremely difficult. I suggest maybe making a delay timer. Basically, once the robot starts spinning, there is a delay of 1/5 of a second before the camera reacts, and the camera has a max turn/zooming speed of so much per second. My second suggestion is a reset button for each task. For example, if the robot pushes a box into a corner, then the player has to start all over again. It would be nice if the current task could be reset to the starting point, thus allowing the player not to restart the level. Otherwise, great game! I like how you have used BetaGUI! Thanks for the nice reply! I will see about that, but if you want, you can use 'R' and 'F' to adjust the camera height. irrdev wrote: My second suggestion is a reset button for each task. 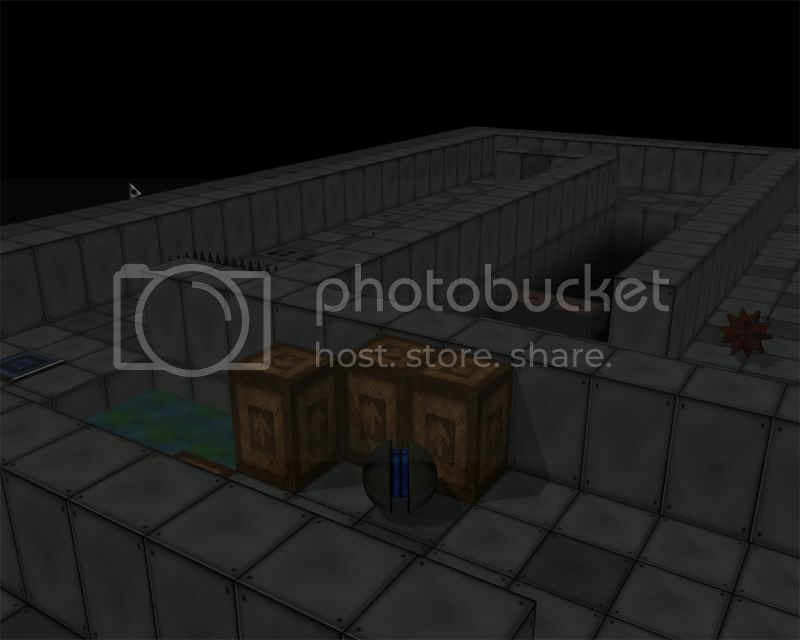 For example, if the robot pushes a box into a corner, then the player has to start all over again. It would be nice if the current task could be reset to the starting point, thus allowing the player not to restart the level. Unfortunately, such a button is not possible. The level is not strictly divided into 'tasks'. Even if it is, the first task might affect the second one and so on. For example, the Player gets a key in the first task which is needed in the fourth task. If he makes a mistake in the fourth task and resets the task, he will lose the key. Maybe, instead of reset task, I can make a checkpoint feature. When the Player goes through a checkpoint, his position and keys etc are saved. When he dies, he continues from there. EDIT: I added two new features. A white key/pickup which gives you the ability to walk on ice, and a purple key/pickup which takes away this ability. Development will be stopped for 2 or 3 days, because I am going to reformat the hard drive and install everything again due to driver problems. Yay! I fixed the computer! Now I have to install Visual C++ 2005 Express, PSDK, DirectX SDK, Ogre CVS HEAD, OgreODE, Blender, Python24, Audiere and a few other things. Ahh, development going at full speed now. I finished making the 5th level. Ideas/comments/whatever are/is still welcome! Sorry for the extreme double posting , but how many levels do you guys think must be there? 1) Controls were a bit fiddely. Can you personally complete it with both keyboard and mouse? I also found it frustrating when trying to move the blocks that the wall would hide my view of the ball. 2) I don't think it should be possible to trap yourself - espessially on the first puzzle. I pushed a box against the wall and couldn't move it again. 3) Definatly needs waypoints. I died once on the acid, once on the bombs, and once on the moving platform but then didn't want to do the earlier challenges again. Probably there should be waypoint every 3 challenges or before really hard ones. 4) Did you mention there was a way to skip levels for testing? I only tried the first one. As for your question of how many levels - maybe you break it into worlds? With different themes? Three worlds with 5 levels each. Your art great (for programmer art) but could use more variety instead of all grey walls. But then I didn't get past the first level - maybe it changes later. I'm going away for the weekend, i'll try and give it another go next week.